In high school, soccer was one of my favorite sports and I was on the school team in Minnesota. 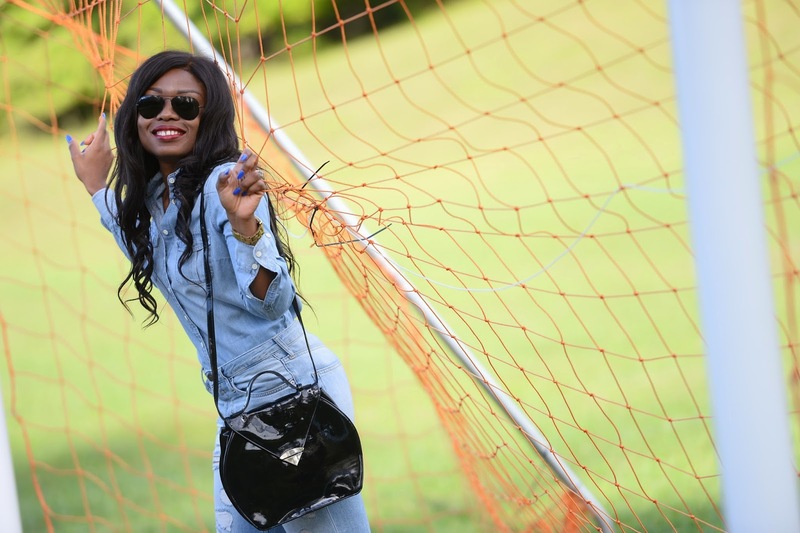 I have been a soccer fan for a long time and as a kid, I often played on the boys’ teams which was a bit challenging….What is your favorite sport to watch or play? Lately I have been collecting high-waisted, distressed and boyfriend jeans. In addition to the Topshop denim featured on this post, I can't get enough of my high-waisted black jeans which I wore here. I really love the "busted" knees and I love the asos denim and piperlime denim collections - simply can't get enough of denim. Have a great weekend guys !!! This is fabulous, the trousers and top almost look like a one piece suit. Such stunning and playful photos too my dear. It's nice to know that you have link with Minnesota. You look lovely and those white pumps are just fab! Love the denim on denim trend. Recently rocked a similar ensemble. I love playing javelin myself. U rock dos wears Uzo!